Panoramic apartment on the 2nd floor. St. Catherine church from the 15 th century. King dating from the 15th century), the outer harbor and fishing trawlers. Ideal for a romantic getaway! Change of scenery ... Honfleur is the ideal starting point for discovering great Norman villages nestled in their green setting, between sea and countryside. Everyone can find what they are looking in Honfleur: tranquility, beauty, aesthetics, painting, music, literature, humor, history or just find pleasure in the ride in the middle of Honfleur which make the city every day and preserve his soul. Come and enjoy with us a real lifestyle. 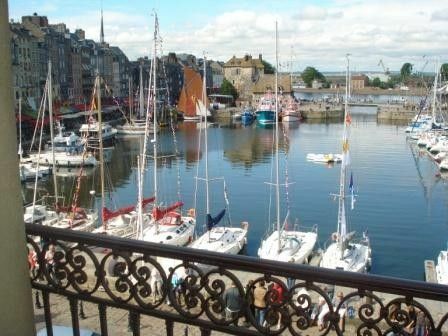 Due to its preserved setting, Honfleur is often featured in television reports annually its old streets and picturesque docks are invested by the shooting of historical films and it is not uncommon to see very famous comedians family the terrace of one of the many harbor cafés. The historic city center is particularly remarkable, but the immediate vicinity of Honfleur are also exceptional: we offer you the apartment cards 18 walks allowing you to discover in a few minutes dream properties, views on the sea and all the estuary of the Seine and sunken lanes or you will feel alone as out of time. Tip: these circuits are particularly propistes to mountain biking. The small maritime city invites you to discover its picturesque streets and old houses in the heart of a conservation area of ​​37 hectares created in 1974. At the time fishing port, commerce and pleasure, the city has managed to preserve and enhance a rich historical and artistic heritage. Honfleur (formerly Honnefleu, viking origin of the name) is a city that documents mention from the eleventh century in which it appears then among the important towns of the Duchy of Normandy. Its privileged location, estuary port and seaport gives it, in fact, many benefits and determines its dual mission: defending the royal river and the departure of the great adventures on the Ocean Sea. Honfleur The sailors then among the best in the kingdom and possess the rare brotherhood in their relationship to the famous Marco Polo. Charles VII write, moreover, that Honfleur has "the biggest and the best contribution of ships Country of Normandy." In the seventeenth and eighteenth centuries, the port intensifies his business to Canada, the Caribbean, the African coast and the Azores. This is a very active center of pilots, owners, traders and even pirates. Among them, Pierre Berthelot, "Major pilot and cosmographer of the King of Portugal", became a monk under the name "Denis of the Nativity" and Jean-François Doublet, "an officer of the Royal" companion Dunkirk privateer Jean Bart. Dating back over 1,000 years but incredibly preserved thanks to the creation in 1974 of a conservation area, Honfleur still holds the same fascination, especially the artists who are still very many to come capture the witnesses of its prestigious past historic and maritime. This is the seventeenth century that we dismantle the fortifications, by order of Colbert built a tidal basin (now Old Dock) and stand the salt stores. In the eighteenth century, thanks to increased trade with the West Indies, the shipyards develop. The city has its origins in the area, located behind the City Hall and including in particular the place Arthur Boudin and city street. In the fourteenth century, to cope with the English invasion, the city is protected behind fortifications overlooking deep ditches which rattled like an island, which earned the pen name to this district. Two suburbs extended from both sides sponsored by the St. Catherine and Saint-Léonard churches. L'Enclos hosted, among others, Notre Dame built in the twelfth century in the center of the present place Arthur Boudin, a cemetery, a hospital in the Rue Saint-Antoine, a manor, stalls, a prison. These days remain in the old path of the king renamed the street of the city, the main street of the Enclosure, two of the three salt warehouses built in 1670. Most of the stones used in their construction from the ancient walls of the city. Their structures oak is the result of the work of marine carpenters of the time. These granaries allowed to store 10,000 tons of salt for the salt tax (special tax on the commodity), salt intended for fishing trips on cod banks of Newfoundland. Both salt stores, classified as "Historic Monument" since 1916, owned by the city since 1952 and restored in the 1970s. Today, prestigious buildings, they welcome every year many cultural events: exhibitions, concerts, shows, conferences and seminars. St Catherine's district developed at the time of construction of the walls of the city. Maritime area, "seafarers" have left their mark. Their old timbered houses remain. Dating from the second half of the fifteenth century, the Church of St. Catherine replaces an old stone church destroyed during the Hundred Years War. It was built by the inhabitants of the city after the British left. With so few resources, they use as a raw material, wood from the forest Touques and knowledge in shipbuilding. It was built in several "campaigns". The first dates from 1460 with the construction of the first ship, the North. With population growth, a larger church became necessary with the construction in 1496 of the second nave. In the early nineteenth century, the interior of the church was given a plaster dressing and a neoclassical Greek columns porch replaced the original porch. Major restoration work was undertaken from 1879, notably with the disappearance of the plasters of the nave and replacement by the current Greek porch porch in 1929. Classified as "historical monument" in 1879, it has attracted the attention of many archaeologists and historians: it is the largest church in France built of wood with a separate bell tower. The bell tower, sturdy oak construction is built on the ringer house. Annex Eugene Boudin Museum, he has visited and religious works (sculptures, souvenirs of Charities and the Chapel of Our Lady of Grace). At the Vieux Bassin end stands the Lieutenancy, so called because the monument was used from the seventeenth century to house the King's Lieutenant. This is the only important vestige of the fortifications of the city, rebuilt over the centuries, especially in the sixteenth and seventeenth centuries. So it is difficult today to recognize in the footsteps of the fortified gate, called "Porte de Caen", who commanded the Middle Ages, the entrance of Honfleur fortress. However, looking closely, there are still traces of the two sides of tearing the old ramparts, which started from the Lieutenancy to surround the fortified city. These ramparts cut the current Old Basin, which was originally much narrower. The door itself dates from the early seventeenth century. It is surmounted by a niche that contains a statue of the Virgin Mary (Our Lady of the Port) and flanked by two graceful corbelled turrets, decorated arms of the city. It was preceded by a drawbridge and defended to the north by a crenellated bastion which no longer exists. With the Plateau is one of the oldest shrines in the region surrounded by ancient trees. The Chapel of Our Lady of Grace built in 1600-1615 by the bourgeois and sailors of Honfleur replaces an old chapel disappeared in a landslide of the cliff. The original chapel was founded before the year 1023 by Richard II Duke of Normandy, to fulfill a vow made during a storm when he had almost perished. Since the cult of Our Lady of Grace has continued. Our Lady of Grace has exceptional votive offerings. All the faithful who come to pray at the shrine are entered and surprised by the impressive number plates, models or inscriptions which testify to the general gratitude. All these ex-votos have a history. Their presence symbolizes the success of a vow, recommendation, a prayer. Of course the protection of marine holds a privileged place. But it can also include expressions of gratitude after cures or the performance of a happy event. Each year, Pentecost is the traditional theater of Marine Day during which it is possible to admire the picturesque and colorful procession ship models worn by children from the Place Sainte-Catherine to the chapel Notre Lady of Grace. The historic city center is particularly remarkable but the immediate vicinity of Honfleur are also exceptional: we offer you the apartment card 18 walks allowing you to discover in a few minutes of dream properties, points of views the sea and all the estuary of the Seine and sunken roads or you will feel good only as timeless. started from the Lieutenancy to surround the fortified city. These ramparts cut the current Old Basin, which was originally much narrower. Each year, Pentecost is the traditional theater of the Marine Festival during which it is possible to admire the picturesque and colorful procession of ship models worn by children from the Place Sainte-Catherine to the chapel Notre Lady of Grace. Free WIFI. (Access codes on the door of the apartment) Behind you: less than a minute walk: 4 bakeries (with their famous strings and French chopsticks), 1 butcher's shop (Place St Léonard), 1 delicatessen and a supermarket ... This apartment is equipped with a 140cm bed, a non convertible double sofa and double curtains coordinated with the set. The kitchenette has a dishwasher, microwave, electric hob, fridge and all the small household equipment ... A bathroom with bath and shower, two cupboards and a separate toilet complete this set.